As upscale care in New York shifts from urban locales in the early 1900s, Knickerbocker Hospital remains in the city to serve a mostly poor, immigrant population. Undeterred by high mortality from sepsis in a pre-antibiotics era, chief surgeon John Thackery (Clive Owen) pushes medicine’s boundaries, pioneering procedures despite his painful past and severe cocaine addiction. Dr. Algernon Edwards (André Holland), recruited by hospital patron Capt. August Robertson (Grainger Hines), is the chief’s professional equal, but Edwards’ color skews Thackery’s opinion — until a chance discovery changes it. The Knick is a sometimes-graphic drama, revealing racism and corruption while desperate people became operating-room guinea pigs. The Knick is just on another level, and is by far one of the best TV shows. Each episode feels exciting, special and leaves you wanting more every time. It is truly special, and will not disappoint. This series is so gasp-worthy, dark, gory, historically accurate and really out there. The music was a little modern and techno for the period in which the series is set. I love love love Clive Owen, but his whispery, gravelly voice was a little hard to understand at times. Maybe it was my sound system, but I had no trouble hearing the other characters. he Knick has become one of my favorite television series, and Season 2 will be must-watch TV for me. 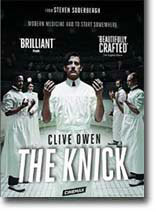 Set in the Knickerbocker Hospital of in New York City in the early 1900’s, The Knick explores several social and public health issues by examining the interactions in this central location. Dr. John Thackery, played by Clive Owen, battles drug addiction and ego as he strives to become one of the most renowned surgeons of his time. Dr. Algernon Edwards, a black physician portrayed by Andre Holland, also strives for success in medicine but constantly battles prejudice and oppression as a black man in America. Several other interesting characters struggle through everyday life at the Knick. While the individual characters are very interesting, what I found to be fascinating was the The Knick’s portrayal of medical practices at the turn of the 20th Century. Doctors perform surgeries on patients without gloves. Liquid cocaine, along with ether, are chosen as analgesics for patients by doctors. Dramatic irony is rampant throughout Season 1 as the audience cringes at the some of the decisions medical professionals make. However, medical understanding was truly lacking in 1900 when compared to 2015. The Knick made me wonder which of our practices today, such as chemotherapy, will future generations cringe at because of our lack of understanding. Character to watch: Clive Owen as Dr. John W. Thackery.